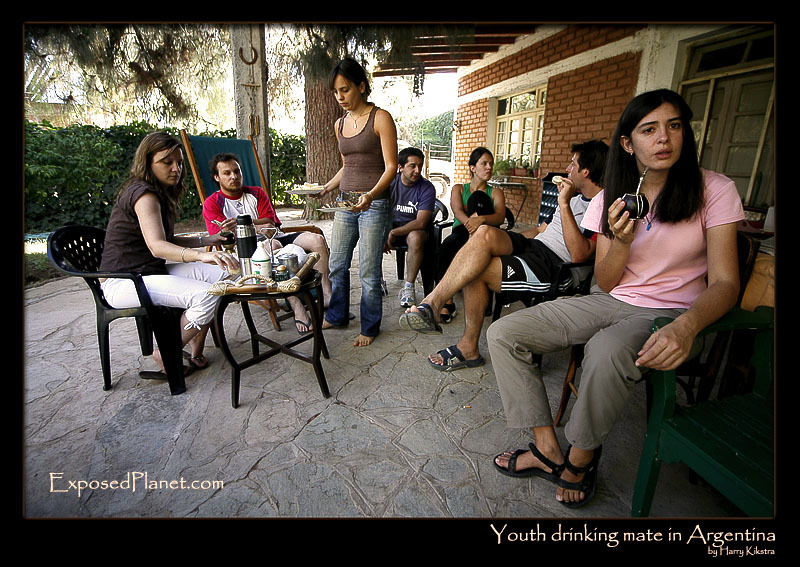 The story behind "Young Argentineans drinking mate"
Every generation has its own features, but in Argentina (and most of the rest of South America), one tradition remains across generations: drinking mate. “Mate (pronounced /’ma.te/) is a highly caffeinated infusion prepared by steeping dried leaves of yerba mate (Ilex paraguariensis) in hot water. It is the national drink in Argentina and a common social practice in Paraguay, Uruguay, and parts of Chile and Brazil. Mate is served with a metal straw from a shared hollow calabash gourd. The straw is called a bombilla (…). The gourd is known as a mate or a guampa, while in Brazil it has the specific name of cuia. Even if the water comes in a very modern thermos, the infusion is traditionally drunk from mates or cuias. The nice thing of this practice is not the taste -it is quite bitter unless sugar is added- but the social aspect. In an age where everything is fast, clean and hygienic, it is nice to see a small bowl of non-alcoholic drink go around slowly among friends and family. Though Argentina is in many aspects still a very developing country, and the overall food culture of late night barbeque, Coca Cola and sugary stuff is not very healthy, we can learn a lot from the strong social bonds.